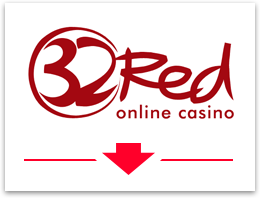 32 Red are a big name, and are leading the way with an all-in one gambling site which is the envy of many other operators. They offer more than 350 games, app, browser and download versions and are backed by top bonus offers which I found quick to clear. If you are looking for the security of a trusted household name brand, along with cutting edge games in all the different formats – then look no further, 32 Red fit the bill perfectly. This casino runs the premier MicroGaming suite of games, via their vivid red lobby and designs. There are a staggering 500 games to choose from, including more than 350 slots and just about every variation of casino table game you could wish for. Some of the best games are already included in their apps, and every week more titles are making the transition. MicroGaming is famous for their cutting edge games, innovation and big-brand tie-ins with their slots too. You can enjoy the amazing ThunderStruck 2 (which is a must-see) or Mega Moolah slots here. I never get bored with the table games, there are too many entertaining variations to play. Sure, Atlantic City blackjack is a cool enough game – but how about a little Double Exposure blackjack instead, my tip here is to check out the ‘Gold Series’ versions, you’ll soon see why! One of the reasons 32 Red keep players loyal to them for a long time is the regular bonuses, promotions and freebies which they hand out. Many casinos seem to forget about you once the welcome bonus offer has gone, 32 Red are certainly not one of those places. Your welcome bonus depends on how much you will start with, and can be enjoyed in Euros, Pounds, Canadian or US Dollars. For smaller deposits you get $32 back for every $20 deposited, that’s 160% if my math is correct. Play-through requirements change up for different games, and start from 30x, which is good but not great by today’s standards. Red Ruby Rewards: Tiered loyalty scheme, collect gems and use them to buy chips. Dish Of The Day: Daily bonus offers, just check your account each day to take advantage. Club Rouge: Special VIP section with awesome rewards for high rollers. 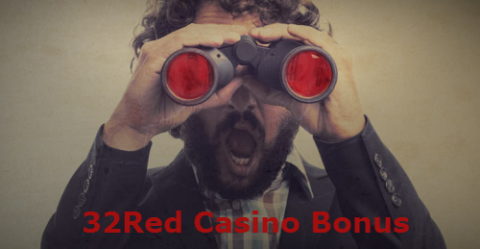 Add to this the unique and one-off specials which are changing every week, and you’ll see why 32 Red are considered a ‘gem’ among the masses of online casinos out there. The downloadable phone app from 32 Red currently includes 53 games, though new ones are getting added all the time. The easiest way to get this it to access their website and use the download button there – I recommend wifi to speed things up a little. There are 37 of the best video slots to choose from including Mega Moolah and that old favourite again – Thunderstruck 2. For me the table games’ graphics are just a little on the small side compared to other casino apps. I do like the way the ‘rebet’ buttons are in the perfect position for your thumbs though. No problems downloading the software. As MicroGaming casinos go this one looks and plays great. One small gripe is the welcome video which plays when you start up the game… that’s a very long minute when I’m ready to play my favourite games. The lobby is nicely laid out and the games are super-smooth as you would expect. A couple of features I like include a space for your favourite games, and the ‘games view’ (bottom left button) which gives you a table showing the latest jackpots and other information on each of the games. See the 32 Red website (link here) for more on the jackpots, the size of these will seriously surprise you. I had a couple of false starts trying to get going with the non-download version, though once it was running I had to admit that this is an impressive setup. This works on Flash, so Mac users will need either a plug-in or to use the download (or app) instead. You can reach all of the major slots via this version. After trying the non-download version on mobile devices I got a little frustrated. What I like to do is check out the games in practice mode, and then play the best ones for real money. From the mobile website I entered the lobby – only to initialize a few games and find that I was not able to play in practice mode. There is probably a way around this, however it should be clearly marked from the start… after all, there are plenty of other MicroGaming casinos who do make this easy. You’ll find a huge feature on MicroGaming slots in this article, including links to reviews of many of the individual games on different devices. For me MicroGaming have the biggest progressive jackpots, biggest selection and a ton of tie-ins with movies and other brands. The slots look great, though are not quite at the 3d cutting-edge (I’d give that accolade to BetSoft at the moment). I do not know of any fans of slot games who will not name at least a few of the 350 games here at 32Red among their favourites. Here are 5 games that I recommend as being first on your ‘must see’ list when you play at 32Red. Rounding out the slots you will also find the traditional 3-reel games + video poker. You’ll need to count them to believe it – but there are 63 variations of blackjack at 32 Red! There are high roller games, ‘gold series’ games, progressives, cool side-games and rule variations like Pontoon and Spanish (strip deck) blackjack too. 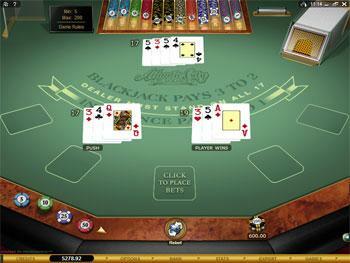 On top of this you have to add the roulette, casino poker, baccarat and craps games. Table games are where it all started with MicroGaming casinos, and they are still the strongest brand when it comes to these casino staples today. Live dealer games are now a feature on the list – thanks to the faster machines and networks around these days. While most of the table games have a $1 minimum, the live dealer games do have bigger overheads, so expect to bet $5 per hand on those. 32 Red tick all of the boxes I like to see. They are licensed in Gibraltar, listed on the London Stock Exchange and are certified by some of the biggest independent auditors out there, including eCOGRA. They also have a track record going back 12 years, which is a great sign for those seeking trusted casino (rogues only ever last a year or two). Great service and fast cash-outs are part of the mission statement for this casino. If you can find better out there, then please let me know – at this time the only people I know of who are better are PokerStars over in the online poker space. With all the major reputable banking options offered, including credit cards like Visa and Mastercard, eWallets and direct bank transfers. The financial community also gives 32Red a positive vote. Huge selection of games, available in app, download and instant play formats. For the best slots, regular promotions and the peace of mind which comes with a big trusted brand, with generous 160% bonuses (£32 for every £20), you’ll get plenty of play for your money too. Check out the current promotions over at www.32red.com now!